OUTPOST: What is a Cyanotype? A cyanotype is a photograph that has an overall blue tint. Technically their colour is described as cyan. It is a blueprint process created by coating paper with a light sensitive ferric salt. After the print is exposed, either through direct contact or through an enlarger, it is permanently fixed by washing in distilled water. 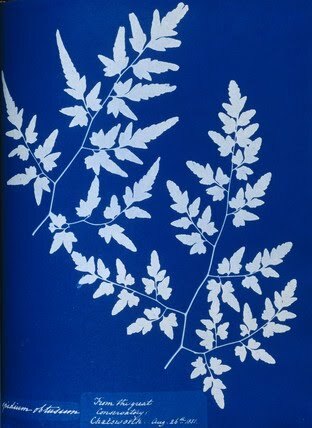 Anna Atkins (1799-1864) was the first artist to produce a book illustrated with cyanotypes. Here is a contact print of ferns that she made from a fern she gathered in the Great Conservatory of Chatsworth on 26 August 1851 (Private collection).